This brilliant painting, oil on canvas, as large as four by six feet, rendered in modern art style but with a mythical theme, represents the ten-armed Devi – Goddess, killing the buffalo-demon Mahisha, better known as Mahishasura. The goddess is attended on her right by goddess Lakshmi carrying lotus in her right hand, and a pot of gems, in her left, and on her left, by goddess Saraswati carrying in her right hand a lotus bud, and in her left, her usual ‘vina’ – stringed musical instrument. Though while the gold complexioned Lakshmi is attired in pinkish mauve ‘sari’ and blue complexioned Saraswati, in light green, in their overall adornment – style of crowns, garlands of fresh flowers and other ornaments, the two figures are almost identical. Two other figures are attending upon the goddess; on extreme right in the lower register is the four-armed Ganesha carrying disc, mace and conch, the attributes of Vishnu, and the elephant goad; on the extreme left is a princely figure with bow and arrow, perhaps Karttikeya rendered in simple human form instead of his six-faced form. Though a votive icon enshrining a large colourfully structured arch, almost all forms static, the image of the Great Goddess charging at the demon with her trident superbly portrays motion and force with which she overpowers the demon. Unlike a routine representation in any medium – stone, metal, textile, paper or canvas, this painting represents the demon’s anthropomorphic as well as animal forms independent of each other. Most other paintings perceive the demon Mahisha, a term meaning buffalo, as half man-half buffalo, often the human form emerging out of the decapitated figure of the animal. In the painting the demon’s buffalo part has been represented as its head. Though with its eye wide open, it lies motionless on the ground. A bit of the animal’s back and tail are other parts visible in the paining. The Devi’s mount lion seems to walk over it. The demon, in his anthropomorphic form, appears to have been completely baffled and dismayed by the Devi’s sudden attack and has meekly submitted. The weapon he held in the right hand has slipped away, and with the shield held in his left, he has fallen on the ground. The Mahishasura-Mardini form of the Devi, now popularly known as Durga, that blends sublime force and commitment to a divine cause with the beauty of a feminine form conjoint with exceptional agility and brilliance, prevails over her all forms, votive or aesthetic, in Devi’s iconography. In this painting the goddess has been represented as carrying in her ten hands battle-axe, spear, wheel, arrow, chopper, mace, club, bow, bell and a large snake stretching down to the demon’s figure and holding him in its coil. 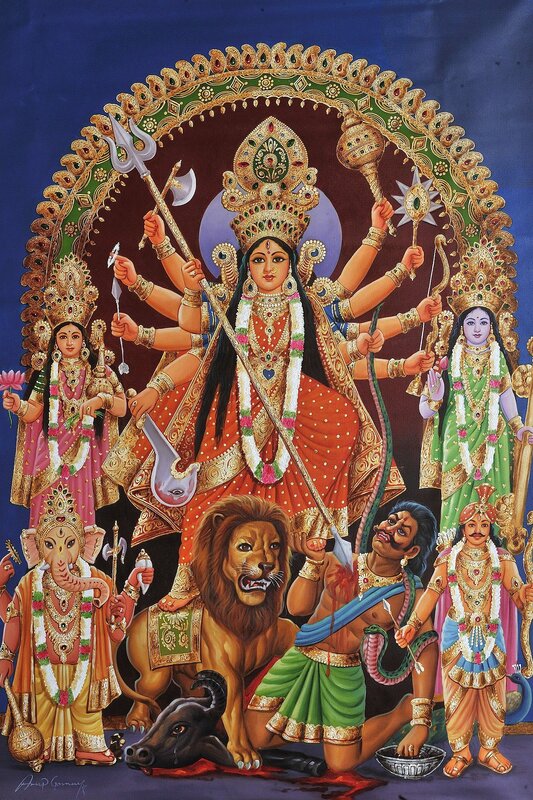 Notably, out of the Devi’s ten arms just two, one charging with spear and the other releasing the snake, are engaged in killing Mahisha, as if not more than just a grain of her power was required to annihilate him. Alike, the Goddess is engaged in battle with the most mighty demon of the day but her face is not turned to him, or is rather turned into direction other than his, suggesting that the evil’s eradication is just her side-target, the world’s weal, to which her face is turned, being her primary. Now a popular myth, a buffalo-faced demon by the name of Mahisha once ruled the earth. By his great penance he had won from Brahma the boon of invincibility against all males. This turned him into a highly ambitious and arrogant ruler. After grabbing the entire earth he invaded heaven and defeated Indra and all gods and evicted them of Indraloka – their abode. Gods approached Brahma for rescuing them and learnt from him about Mahisha’s immunity from death at the hands of all males, gods, human or beasts. On Brahma’s revelation that a female alone could kill him, after due deliberations gods decided to create a female power out of their divine attributes as also bestowing on her absolute divine beauty and female graces, such as made her represent also the absolute womanhood on the earth. Thus, the Great Goddess, out of gods’ power and with their attributes was created. Finally, sage Narada disclosed to the newly created Goddess the sad plight of gods and the errand for which she had been created. The Goddess delightfully accepted the prayer of gods and later in a fierce war killed the buffalo demon Mahisha. Anup Gomay, a contemporary artist with rare talent for portraying myths realistically marking the continuity of the great tradition of the modern art style which reached its zenith in the paintings of Raja Ravi Varma, has painted this excellent art piece.